TB10042 - Marco Beverage Systems Ltd. The following update is a chargeable optional upgrade in the event of failure of the touchscreen or pump. It is not a compulsory upgrade. Robust Power supply for the pump to reduce current failure rate. Robust Display screen, no issues with SD card memory. Dilution setting. 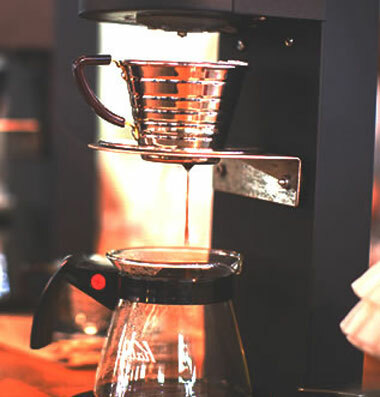 Feature to allow a % of coffee dilution by mixing water to coffee ratio. New software will incorporate a Low water pressure warning when insufficient supply to machine. Please note the PCB board removed Marco P/N 1600201 should be packaged and returned to Marco to receive a full refund for this part. The Update has been divided into two parts as above to simplify installation in blue and green below. The following procedure should be carried out by trained personal. A) Update 1: Replace the New main PCB & touchscreen. Before powering down the machine record the current settings in the Menu specific to that customer. Temp, ratio, Mode, Power setting etc…. Plug out the Jet 6 from mains supply. 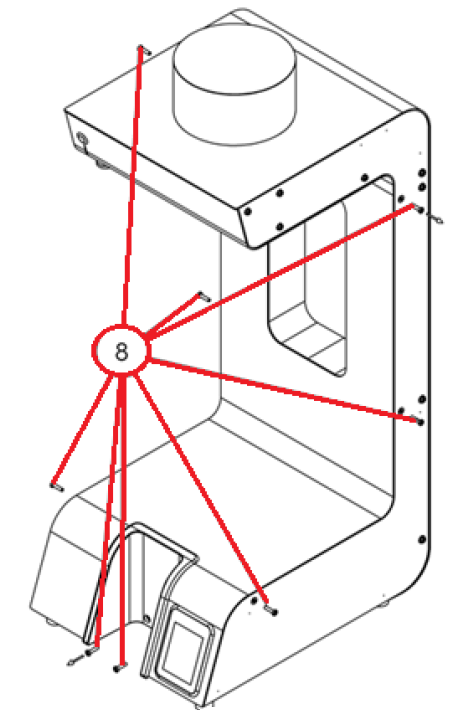 Remove the earth cable attached to the front panel located bottom left side as per Fig 2.0. Insert the new touchscreen ensuring correct way up, Fig 3.0. The SD card slot should be facing outward. Remove the PCB board by pinching the 6 securing clips (fig 4.0). Locate the new PCB board onto the 6 plastic mounting clips and reinsert the cables/ cord into the correct locations. (Use the photo previously taken if unsure) Make sure the battery is inserted into new main PCB board. 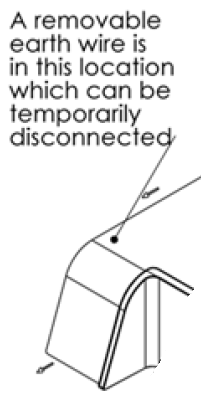 See fig 3.0 for battery location. 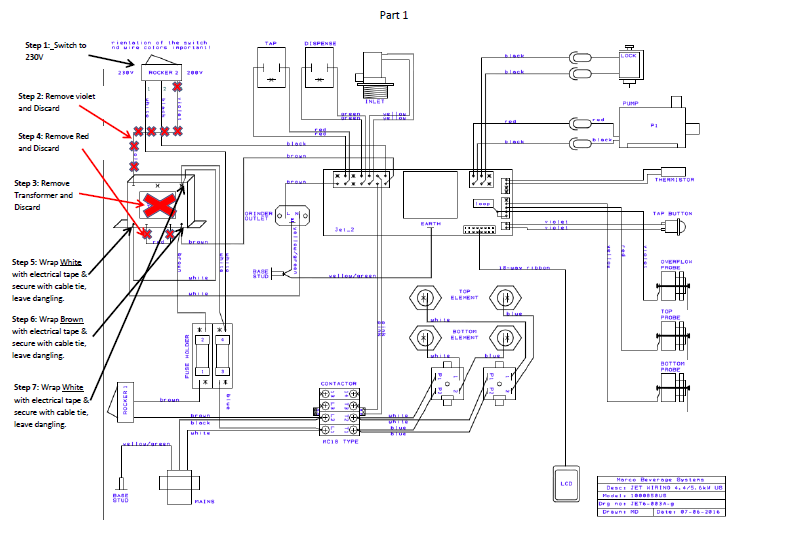 Wiring diagram included Fig 5.0 for EU & Fig 6.0 for USA (2 parts) for any clarifications on PCB. Connect the 16 pin ribbon provided in the kit to the main PCB board and the new touchscreen. The ribbon must be inserted the correct way on the board. Locate the slot on the 16 pin connector and the PCB and pair them the same way! A) Update 2: New regulated Power supply for the 24VDC pump. Start the process by removing the pump bullet connectors. These can be quite tight, use a pliers to pull apart. Remove the wiring on the left side of the Jet and cut the existing cable ties to loosen the wires. Take the new Power supply board and place it with connections facing down. 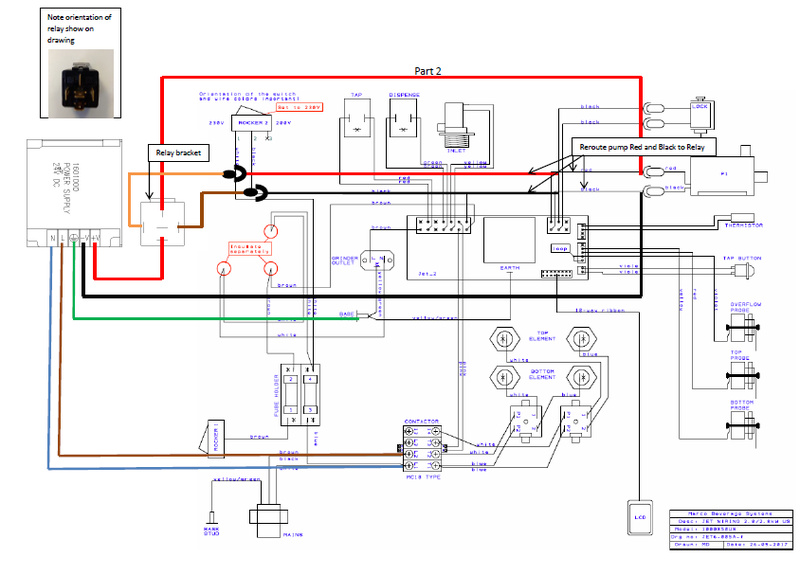 Start by rerouting the connections from the pump bullet connectors to the regulated supply, BLACK & relay RED top connection on the relay. Please note the orientation of the relay as illustrated in Fig 5. 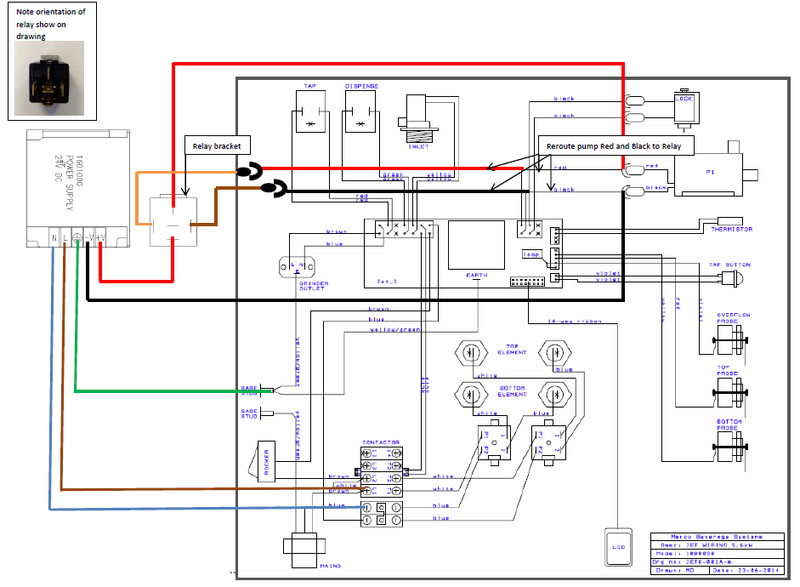 Now connect the red and brown cable provided in the kit to the relay pins as shown in Fig Fig 5.0 for EU & Fig 6.0 for USA(2 parts) and connect to the main PCB using the existing bullet connectors for the red and black cables. Connect the Live and neutral wires, Brown & blue respectively provided in the kit using the wiring diagram in Fig 5.0 for EU & Fig 6.0 for USA(2 parts) to the connector block and neutral block. Connect the earth cable provided to the Regulated power supply as illustrated. Remove the 10mm screw on the left side which is connected to the front S/S panel and locate the earth cable here. 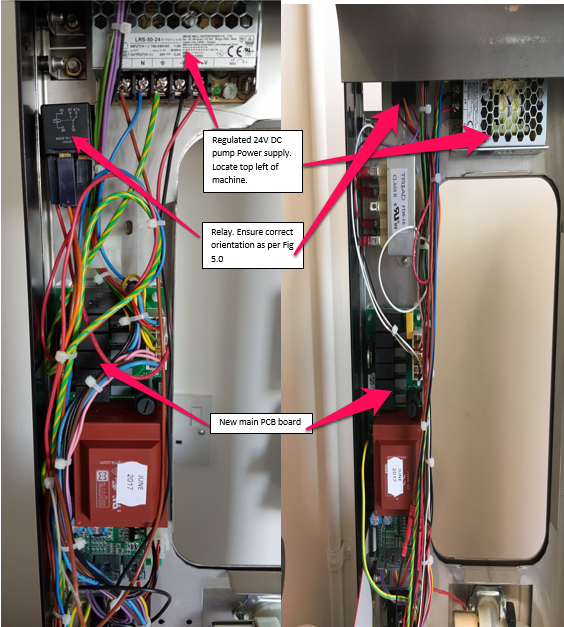 Now that all wires are correctly connected locate the new regulated supply & relay on the top left of the machine as shown in Fig 7.0 for EU & Fig 8.0 for USA.. Simply remove the protective cover on the back and stick to the machine. Route all the wires neatly on the left hand side and cable tie same to the existing loom. Use the illustration in Fig 7.0 for EU & Fig 8.0 for USA. 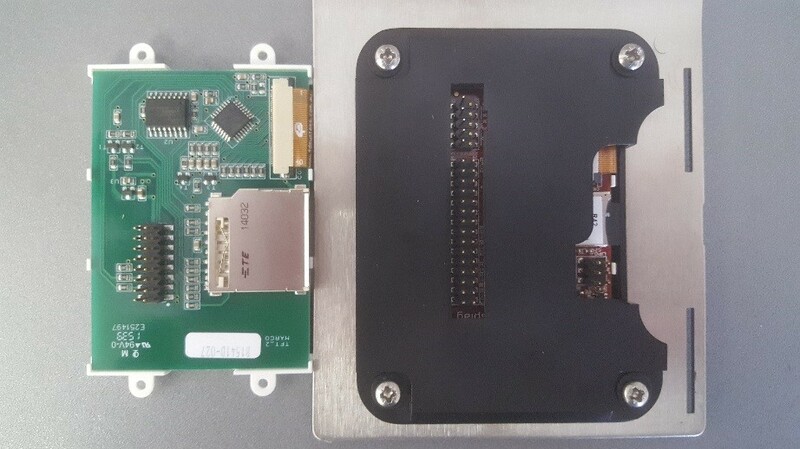 Ensure all cables are correctly inserted into the main PCB board and relocate the S/S panel back on the machine ensuring the earth cable is re-inserted to the front panel, fig 2.0. Now insert the ribbon cable 16 pin onto the new Touchscreen, again ensure the orientation is correct. See Fig 3.0. Secure all 6 screws once housed correctly on the machine as per fig 1.0. Relocate the drip tray recess and secure with the two screws as per fig 1.0. Plug back in the machine and the new software will display Jet 6 1.5 LCD followed by version 2.2. Upgrade is successfully complete. Reprogram the machine with the saved settings as per the first step. Perform a Grinder calibration if fitted. Machine is now ready for use.